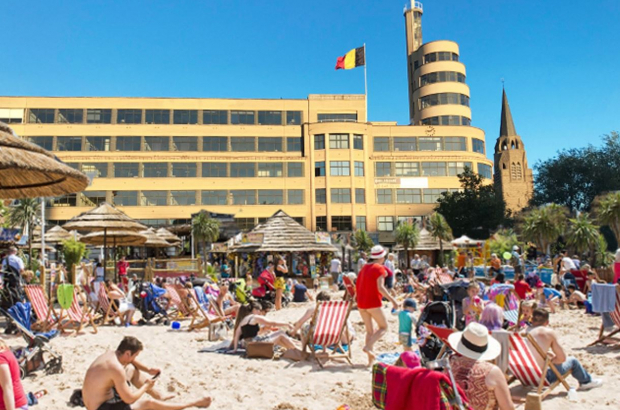 Two candidates in this October's municipal elections in Ixelles have put forward a proposal to turn Place Flagey into an urban beach over the summer holidays, with sand, deckchairs and children's play areas. Geoffroy Kensier and Kathrine Jacobs from the Objective XL group have taken inspiration from Bruxelles-les-Bains, the urban beach by the canalside in central Brussels which finishes this weekend. They believe Flagey Plage would bring a more family-friendly image to a part of Brussels known for its late-night partying. Jacobs said the idea came about after she and her two young girls made regular visits to the Flagey fountains to cool down in the recent heat. "We met other parents who complained that they did not have a garden, they couldn't go on holiday, and they were looking for places for their children to play," she said. "We think that Place Flagey, which is already a wonderful meeting point during the weekend market, could also be turned into a beach for the summer. The idea isn't for it to be a night-time venue with an open bar all evening long. It would really be a calm, daytime hangout." Ixelles mayor Dominique Dufourny is not against the idea in the daytime - but would oppose anything that attracts more late-night drinking and noise to the area.